HARRISBURG, March 11 – In several meetings over the past few months, state Rep. Pamela A. DeLissio, D-Montgomery/Phila., talked with area students about what it means to be an engaged citizen and explained the legislative process. “It is never too early to teach what it means to be a good citizen, and the students of the 194th Legislative District – from home schoolers through a senior attending J. R. Masterman – are wonderful examples responsible of citizens in the making,” DeLissio said. In late January, DeLissio had the opportunity to speak to a government class at the invitation of constituent Adia Hayden. HARRISBURG, March 11 – Pennsylvania budget negotiators would be wise to enlist the help of a mediator to end the eight-month budget stalemate, Rep. Pamela A. DeLissio said during House state budget hearings Thursday. Her testimony followed three weeks of House Appropriations hearings concerning the 2016-17 budget. The 2015-16 state budget still has not been settled. Pa. state Rep. Pamela A. DeLissio spoke before the House Appropriations Committee during a hearing on the state budget to call for the service of a mediator to help pass an adequate budget. PHILADELPHIA, Feb. 25 – State Rep. Pamela A. DeLissio, D-Montgomery/Phila., will host her next town hall Thursday, March 3 with Pennsylvania Secretary of Education Pedro Rivera. The town hall is scheduled to take place at 7 p.m. Thursday, March 3 in the Multi-Purpose Room at W.B. Saul High School, 7100 Henry Ave.
“Everyone who has an interest in the education of our students should take this opportunity to attend this town hall,” DeLissio said. “Secretary Rivera will be discussing the goals and concerns of basic public education in the commonwealth. I am sure there is much to embrace and understand. To ensure a seat, constituents should call 215-482-8726. It will be DeLissio’s 54th town hall. DeLissio is featuring members of Gov. Tom Wolf’s cabinet in the next three of her monthly town halls to better inform constituents about how their commonwealth agencies work. Her April 14 town hall is slated to feature Department of Labor and Industry Secretary Kathy Manderino, and her May 12 town hall is scheduled to include Department of Aging Secretary Teresa Osborne. PHILADELPHIA, Feb. 5 – State Rep. Pamela A. DeLissio, D-Montgomery/Phila., is participating in the Pennsylvania Legislative Appointment Initiative, which allows each state legislator to appoint a student from their district as a commonwealth scholar for admission to Valley Forge Military College. Any senior high school student who resides in the 194th Legislative District with an interest in attending the Valley Forge Military College may apply. PHILADELPHIA, Jan. 29 – State Rep. Pamela A. DeLissio, D-Montgomery/Phila., will host a follow-up meeting regarding safety and speeding on Henry Avenue at 7 p.m. Thursday, Feb. 11 in the Wolcoff Auditorium at Roxborough Memorial Hospital, 5800 Ridge Ave.
Free parking is available in the Jamestown parking lot on Jamestown Avenue. Representatives from PennDOT, Philadelphia Streets Department, City Councilman Curtis Jones’ office, and local and state law enforcement agencies will attend. Also on the agenda for discussion is the Walnut Lane Bridge closure, which is slated for April 1 and expected to last six months. PHILADELPHIA, Jan. 29 – State Rep. Pamela A. DeLissio’s Tele-Town Hall, conducted over the phone on Jan. 21, reached hundreds of constituents. The call’s recipients listened in, asked questions, and participated in four opinion polls. The call offered an opportunity to ask questions pertaining to any state-related topic. The range of questions was diverse and the answers informing, she said. Questions were asked about the status of the 2015-16 budget. HARRISBURG, Jan. 29 – State Rep. Pamela A. DeLissio, D-Montgomery/Phila., on Wednesday in the state Capitol discussed her support of H.R. 634, which designates January 2016 as “National Human Trafficking Awareness Month” in Pennsylvania. The resolution is traditionally called for a vote on the last day of session before the Super Bowl, because it is documented that trafficking increases around large events held in urban areas such as the NFL championship game. Law enforcement is also expected to be vigilant at the upcoming Democratic and Republican national conventions for the same reasons. 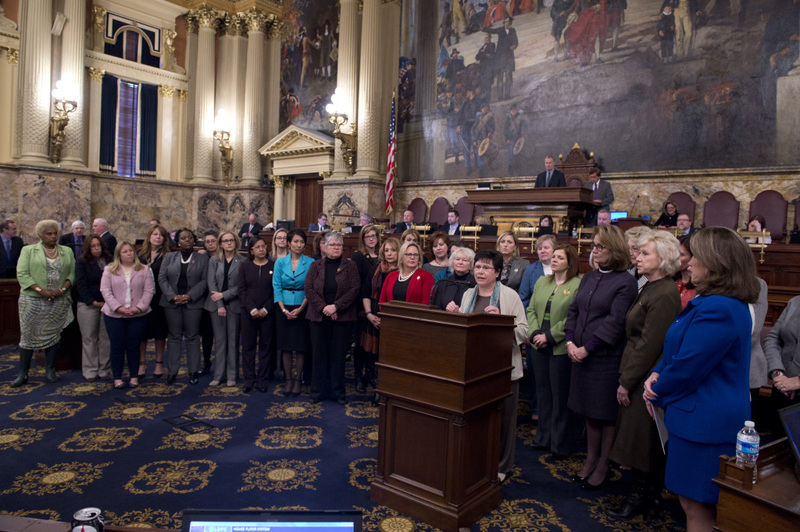 HARRISBURG, Dec. 11 – State Rep. Pamela A. DeLissio today joined fellow Pennsylvania House Democrats in the Capitol to call for work on the budget, as opposed to the day off. “The citizens of the commonwealth have gone 164 days without a state budget for senior services, schools, health services and much, much more,” said DeLissio, who represents parts of Montgomery and Philadelphia counties. “It came as a total surprise when the Speaker announced on the House floor yesterday that session was canceled for today. There was no reason offered for the cancelation. This is the third time the session schedule has been interrupted in the past four weeks when the expectation has been that we are in session until the budget is completed. We should be here every day until a budget is enacted, particularly due to the fact that a framework was agreed to by all four caucuses and the governor several weeks ago. It appears that the House Republicans are marching to a drummer that they alone are hearing.